The best way to prevent your home or business from suffering catastrophic losses in the event of a fire is with the proper fire protection and fire preparation. The best way to prevent your home or business from suffering catastrophic losses in the event of a fire is with the proper fire protection and fire preparation. Here are some of the basic steps that you should take to limit losses and prevent your business from ever having a fire. Before doing anything else, you should come up with a plan for the safe evacuation of your building in case of emergency. Make sure that all employees know the quickest and safest way to exit your building from points throughout it. For example, where should you exit from your desk? Is that the same way you should exit from the bathroom? Always post signs with the quickest evacuation route clearly labeled for guests and employees. Also, come up with a central meeting place that everyone can gather once they have evacuated. All of your employees should also know where the fire extinguishers are located and how to operate them. These small fire preparation steps can dramatically reduce the chances of something happening. If you aren’t sure what will happen inside of your building in the event of a fire, it can be very scary. Make sure that you understand the commercial fire protection systems that you have installed, the order in which they will go off, and what to expect. 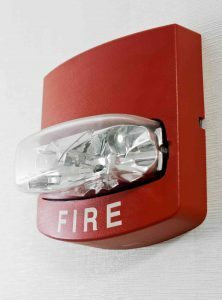 When sprinkler systems, fire alarms, and other fire protection devices all go off at the same time, it can be very noisy and confusing. Walk your employees through what an actual fire would look like so that they will be able to handle evacuating safely and in an orderly fashion if the real thing occurs. Again, a little bit of fire preparation in this regard can go a long way when it comes to keeping your business safe. Wait for the fire department to arrive, at which point they will extinguish the fire and let everyone know when it is safe to reenter the building. Another option is to take precautions that reduce the risk of fire in the future. This entry was posted on Friday, July 14th, 2017 at 4:23 pm. Both comments and pings are currently closed.